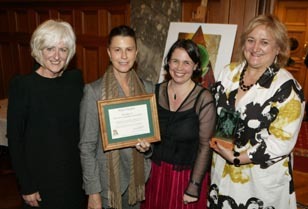 Auckland artist Robyn Hughes has been awarded the Big'A' Prison Arts Leadership Award 2010, presented last night at an awards ceremony in Parliament at Arts Access Aotearoa's Big 'A' Awards 2010. Alison Thom, General Manager, Rehabilitation and Reintegration Services, Department of Corrections, presented Robyn with the Big ‘A’ Prison Arts Leadership Award. The award recognises the outstanding contribution of Corrections staff or volunteers in the rehabilitation of prisoners through the arts. “Thanks to the work of committed Corrections staff and volunteers, there are many positive stories from around New Zealand prisons demonstrating the value of art as a constructive activity,” Alison said. 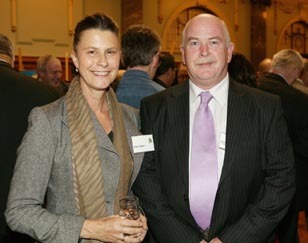 The Big ‘A’ Awards 2010 were hosted by Parliament and Hon Christopher Finlayson, Minister for Arts, Culture and Heritage, in the Grand Hall of Parliament. Robyn lists the learning of life skills such as team work, communication, self-criticism and following projects through to completion among the many benefits of prison art programmes. “Throughout all the art projects, I worked with some wonderful prison staff, many dedicated artists from the community, some very talented and focused men in the prison and a strong inmate art komiti,” she said. “Without this team, we could have never achieved what we did. Robyn has a Bachelor of Fine Arts, Elam School of Fine Arts, Auckland University; a Post Graduate Diploma in Print, Central School of Art and Design London; and a Master of Fine Arts, RMIT University, Melbourne. She has lectured in New Zealand, Italy, Canada and Britain. Her strong links with other professional artists and Elam has meant that a constant stream of artists have visited and attended workshops with the prisoners. Robyn has been involved in many exhibitions and community projects. She was instrumental in the organisation and completion of the ambitious Auckland Children’s Hospital art project in 2004 and a second project in the City Hospital in 2007. Artworks still adorn the corridors of both hospitals, brightening the lives of patients and visitors, and raising the profile and confidence of the artists. Original generation time 1.2318 seconds. Cache Loaded in: 0.0004 seconds.